On July 31, 2012, Governor Chris Christie appointed fifteen (15) public members to Interagency Council on Homelessness. This is an important step in our collective efforts to end homelessness in New Jersey. Representative from Mercer County are Board Members of the Mercer Alliance to End Homelessness: Frank A. Cirillo (Trenton, Mercer), Director of Welfare, Mercer County Board of Social Services; Constance Mercer (Lawrenceville, Mercer), Executive Director, HomeFront; and John J. Monahan, LCSW (Ewing, Mercer), President & CEO, Greater Trenton Behavioral HealthCare. Interagency Council on Homelessness has a year to develop a ten year plan. The MERCER CASH Campaign ( Creating Asset, Savings and Hope) promotes the Earned Income Tax Credit for low-wage workers, free tax sites across the county and creates partners to provide asset building in Mercer County. Mercer Alliance to End Homelessness chairs and supports the campaign with community volunteers, partners from non-profits, business and government. 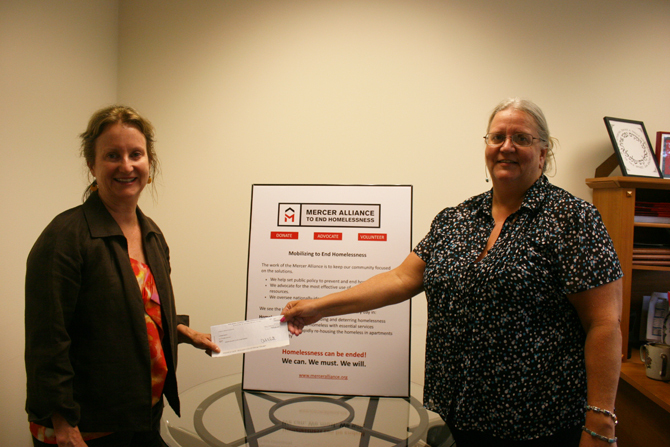 New Jersey Manufacturers Insurance Company has granted Mercer Alliance to End Homelessness $10,000 for the Mercer CASH Campaign. If you have veterans who are interested in filing claims for Veterans compensation and/or pension please refer them to my email address and or cell phone # 973-704-3865. I am able to take claims for these benefits over the phone as well as provide advice on other benefits that they may be eligible for. I also conduct training for shelter/agency staff in VA benefits and will do onsite visits to take claims or answer questions to groups of veterans. If they require assistance in getting into VA healthcare programs such Healthcare for Homeless, the Domiciliary program or transitional housing they may call me VAMC Lyons directly at 908-647-0180 x14217 Paul, Charbonneau, or email: paul.charbonneau@va.gov.